My watch arrived late Friday afternoon. That setup required about 10 minutes. Saturday was my first full day of usage. The watch is comfortable. 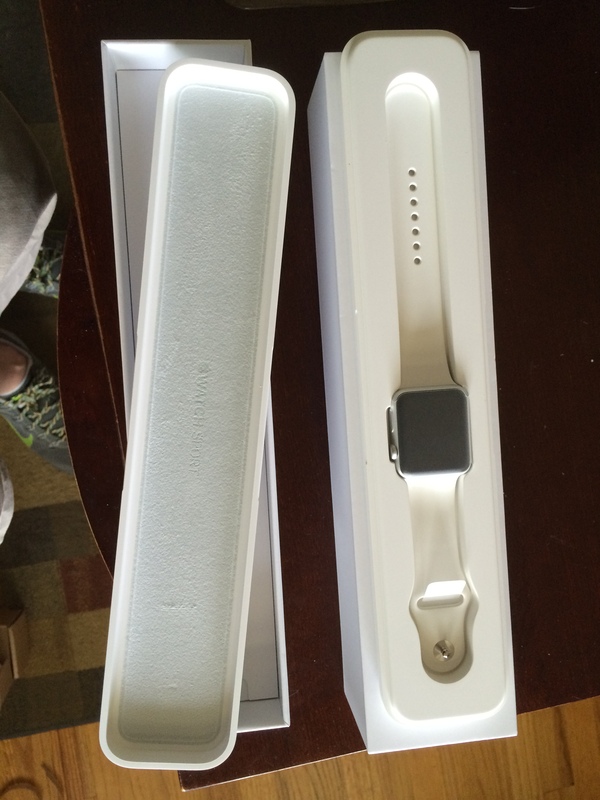 I purchased the 42mm Sport model with the white band. The size of the watch is similar to my Pebble but looks much nicer. I put the watch on at 7:30AM with a 99% charge and took it off at 11:30PM with 35% remaining. Interestingly it seems to drain the battery on my iPhone 5s faster than normal. I charged the phone for about 30 minutes in the afternoon as a result and that got me through the day. The initial setup copied all of the compatible apps on my iPhone to the Apple Watch. Setup required about 10 minutes. I had notifications turned-on for everthing. I discovered that wasn’t a good idea for the majority of my iPhone applications. In the early afternoon I turned-off all notifications with the exception of text messages, Twitter, Facebook, phone calls, and my sport score feeds (NBA & NHL). The watch is great for reading and responding to text messages. Siri on the watch work well for responding to text messages. Responding to Tweet notificaitons and messages also works well. Wunderlist’s first try at the Apple Watch provides a good way to look-up list times but lacks a way (that I’ve found) to easily add new items. I assume Wunderlist will add that feature in a future release. Until then, I’ll use the Draft’s watch app to record new actions and my iPhone to sync them to my Wunderlist later. I use the Fitbit but I like the way the Apple Watch fitness application works. It taps you to get up every hour and move around. This is a nice reminder if you work at a desk for long periods of time (I do when I’m writing). All of the settings are customizable. For a first edition the software is well-done. I’m sure that it will improve over time and I’m hopeful that Fitbit will create a good watch application. While the Apple Watch itself had plenty of juice but it did increase the battery drain on my iPhone. This was mostly due to increased usage because I was fiddling with the “My Watch” settings on my iPhone 5S. My phone usage way beyond normal. I didn’t time it but I’m sure I spent at least an hour more than normal on my iPhone Saturday morning. I’m heading to San Jose to participate in a conference. This will provide a real-world test of the Apple Watch with my favorite travel apps. I’ll be using the Delta check-in application, Tripit, and Uber on my Apple Watch. I try both Apple Maps and Googlemap,Tripadvisor, and the Open Table (reservation) applications. My usage patterns be more typical of how I will use the watch over the long haul. I’ll report on my battery life and user experience at the end of next week. I was an early supporter of the Pebble Watch on Kickstarter. Pebble is a better option if you don’t want to charge your watch every day. I can count on 7-days of usage per charge on my Pebble. The Apple Watch requires daily charging. Because Apple didn’t skimp on the length of the recharging cable, this isn’t a problem. I also like the way the Apple Watch notifications work. Both Pebble and Apple Watch offer audible notification. I tend to use turn off the audible notification and rely on haptic notificaitons. The Apple Watch’s haptic feedback is better than the Pebble. My Pebble’s buzz is somewhat annoying. I prefer the more subtle tap that the Apple Watch provides. Reading or responding to long emails on the Apple Watch isn’t practical. The screen to too small for longer responses and emails are truncated on the watch. I like using Drafts on the Apple Watch for quickly capturing voice notes that are transcribed to text. These notes are immediatley availabe to the Drafts app on my iPhone and from there I can share them to a large variety of other applications-like Evernote. I don’t like Evenote’s Apple Watch application because it takes forever to load. The Drafts loads very quickly. The heart rate monitor is fun. My resting heartbeat when I get up in the morning is between 55-62 BPM. During the day I seem to hover between 64-70BPM. I look forward to charting my heart rate after I’ve been using the watch for a couple of months to learn what my normal BPM range is for different times during the day. It’s cool that I can use Apple Pay on my watch even though I have an older iPhone 5S. I’m looking forward to trying that feature. I’m also planning to test the Starbucks app this week to pay for a cup of coffee. So far I’m happy that I purchased the Apple Watch Sport. It is light and comfortable and don’t look as dorky as the Pebble. The $400 price is reasonable considering the robust infrastructure provided by Apple and variety of apps supporting the watch.